UPSC Civil Services Admit Card 2019 IAS Hall Ticket Online Download (यूपीएससी सिविल सर्विसेज एडमिट कार्ड 2019 आईएएस हॉल टिकट ऑनलाइन डाउनलोड करें) Union Public Service Commission (UPSC) has released the notification for the release of UPSC IAS Civil Services Admit Card 2019 for Preliminary and Main Examination. Candidates who have completed the online application form procedure along with the payment of with requisite fees for the Civil Services Examination will be issued the prelims admit card. Therefore the candidates who qualify the prelims exam by obtaining the required marks more than cut off can download the IAS Admit Card for the main exam. Latest Update: UPSC is going to conduct the Civil Services 2019 Prelims exam on 02nd June 2019 & Mains Exam on 20th September 2019. Applicants can download the UPSC IAS Exam Admit Card 2019 from here. Union Public Service Commission releases various job notifications every year and provides job opportunities to the individuals. Recently it has release UPSC Civil Service Exam notification. Therefore all the interested candidates who have already applied for the job post are now currently waiting for UPSC IAS Admit Card 2019 can now download it soon. The Commission will release separate e-Admission Certificates for both prelims and main examinations. Hence IAS Hall Ticket 2019 for prelims will be released after the completion of application process. UPSC Admit Card for IAS Main 2019 will be available for download just a few weeks before the examination. In regards to other details such as download UPSC IAS Civil Services Admit Card 2019 go through the article and get details. Candidates who have applied for UPSC Civil Service Examination have to download UPSC IAS Call Letter through its official website. UPSC IAS Preliminary Exam Admit Card will be available on May 2019. Therefore candidates can download e-admit card for UPSC Civil Services Preliminary Exam three weeks before the examination. Job seekers appearing for IAS Prelims Exam 2019 can now download IAS Call Letter through DOB, Registration id. 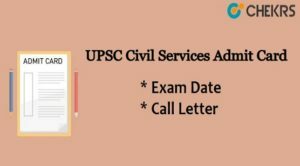 UPSC Civil Service Admit Card is an important document as it includes information such as examination name, candidates’ name, father name, applicant registration number, exam date, time, the address of examination center, roll number and general guidelines which must be followed by the aspirants in the examination hall. Therefore UPSC Admit Card 2019 is an important document for entering the examination center as without it the candidate shall not be allowed to enter the exam hall. Union Public Service Commission executes all of its recruitment related activities online. Hence it provides the facility for downloading IAS Admit Card within just a click. To check details of downloading UPSC Civil Services Exam Admit Card 2019, refer the steps below. Union Public Service Commission (UPSC) has announced the notification for the release of UPSC IAS Civil Services Admit Card 2019. Therefore to get details of IAS Call letter to keep visiting our site www.jobs.chekrs.com. We will provide you with the upcoming details of UPSC IAS Hall Ticket download process. In case of any query or review, your valuable comments are most welcome in the commenting section below and our team will get in touch with you shortly.